A plain lifeless canvas is brought into life by a single drop of color black, it’s brush strokes let a painter paint his imagination which spellbind millions of people. When a beauty lets her Wavy inky-black tresses free, it’s allure captivates all the eyes around. When a black classy luxurious sedan pass on road, it makes craving heads turn. An intense deep black eyes is all it takes to swoon. The desire of black is as deep as it’s shade, it has so many meanings that deciphering each is a Hercules task, it’s mystery is fathomless. World shall Perish into BLACK. I personally have always been attracted words it’s charisma, as I mentioned in the poem above, it’s not just a color, it’s an attitude, a lifestyle & lot more then that. I can never get enough of it, from owning a pure leather black handbag, to a pair of pretty Black studded stilettos, also the very famous must have LBD (little black dress). Even my beloved dairy which I use for my writings is black. a writer and a pen? a pen and it’s Ink? Being a writer most beloved thing to me is a pen, it’s my pride, my jewelry, my weapon and it’s my gift. It lets me discover myself as I use it to scribble my thoughts on a plain white sheet of paper. For me it’s a connection between denial and self acceptance. It’s most precious thing for me and I do like pens which has a deeper meaning to it’s existence, which itself is legendary and sings it’s own tale of genesis. I am used of reading between the lines so I desire no ordinary pen but THE Montblanc Patron of Art 4810 Limited Edition : Queen Elizabeth I Fountain pen in black with Black ink. Why do I desire a pen from Montblanc? because Montblanc in English means “Masterpiece” and nothing else to satisfy my soul but the masterpiece and they are the best German manufacturer of writing instruments. Now, why this particular pen? Well, how do I begin, it’s not just a pen, it’s a symbol of power, education, art, and a golden era in history which produced the masters like William Shakespeare, Edmund Spenser, John Dowland, William Byrd and Thomas Tallis, the legends of literary world. This pen is after the Queen Elizabeth I, the lady who was one of the best educated women in her era and known as a gifted writer. She still is recognized as the most powerful monarch in Britain who has two complete eras named after her. At the beginning of her time, she was shunned by the society and her family after her marriage and was sent away for studies and this pen denotes that, it portrays how a women who is shunned by the court, society and family can rise and rule and be remembered even centuries after her existence. It bespeaks the power of education especially women’s, the capabilities of an individual only if they put their mind into it. The adornments of this pen reflects heraldic regalia, the life and reign of Elizabeth I. It’s nib is of 18 K gold handcrafted,there is a bejeweled gold crown which of Elizabeth I, Her motto is engraved on the cap ring “Video et Taceo”, The rose as the symbol of the Tudor dynasty, It is made of precious lacquer, Gold and princess cut green garnet. This pen symbolizes the beauty of past with the present exquisite taste. There is nothing eternal than words, black printed words. Beauty fades, nations fall, people die, mountains move but words stay firm and can’t be taken back. They hold the ultimate power and hold ultimate secret of all. They can make nations or break them, they define us, give us emotions, even when unsaid makes us it’s slave. They can be weapons or things that woo and I want to preserve them for they are most precious and a best place to preserve them is in an elegant library at my home. Behold, no ordinary library but shelves specially crafted by ebony. Ebony is a dense black wood which gives a very royal smooth black antique finish. And the library will have a secret passage/door 😀 to a secret room that no one will know about, just me and my lovely readers (Promise not to tell anyone and keep it hush hush) . That’s the kind of a library I desire, my dream library. It’s a beautiful day, Hallelujah! Black is a color that absorbs everything and leaves only intense mystery. Roads are the same, they absorb all your memories and stories of the journey you had over it and leaves other in bewilderment. Doesn’t that sound mesmerizing, to go for a long drive or merely drive to your office, mall, friend’s place or anywhere smoothly, without road bumps, open sewer and specially potholes. But smooth ride is a dream. I urgently wish and desire for smooth Potholes-free clean Black Roads in city as well because that’s where I travel the most. Every morning when I leave my house specially in monsoon I say “wish we get smooth Black asphalt roads soon”, it’s not too much to ask for? pretty reasonable, right! In monsoon due to lack of proper drainage system, roads become small canals and potholes leads to life threatening danger. 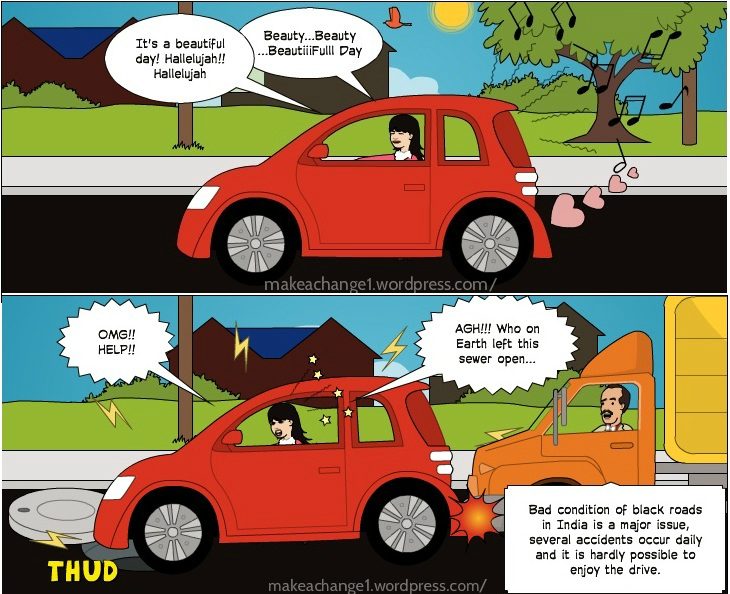 Most of the road accidents that happen India are because of the poor road condition. It sinks my heart to see that so many people die in road accidents when it can easily be averted. Thus, a beautiful sight was ruined by a torturous ride. How I wish for smooth safe clean Black asphalt roads. In this era, there is only one thing that denotes the ultimate supremacy, yes you got it right, The Iron Throne, the king’s authority of Seven Kingdoms for which all the great powers of ‘Game of thrones’ are fighting, playing tenacious games, back stabbing each other just to have a seat on this Black asymmetrical cold, hard uncomfortable looking chair with jagged edges and twisted metal made of thousands of swords surrendered by the enemies. Doesn’t sound appealing, right? I know! Exactly that’s why I desire it so bad, I really want to see for myself what’s the spell it holds on all the brilliant rulers of all the seven kingdoms. Okay *Sigh* I know Game of thrones is a fictional drama series written by GRR Martin and aired by HBO. But that Iron throne is very much real, believe me, it is there on their set each day, everyday. It’s so alluring that even Queen Elizabeth came all the way from London just to have a seat on that. Now, do you see it’s power, it’s supremacy! Yeah that’s the ultimate power that whisperers all the nefarious notions in every one’s ears and that’s why I want to owe it so this evil war cease and goodness spreads for I won’t be the power-hungry ruler but the one who will make harmony prevail. Well some may argue it’s not completely black, has a hint of grey to it but that’s why I want one specially made for me in color raven BLACK. Since I am talking about the iron throne I might as well tell about my desire to have a pair of Iron throne black Killer heels and an Iron throne Smartphone cover, Why? DUD! It will go very well with my Iron seat, Opps! I mean Iron Throne. *Poem Black and it’s edit and the cartoon script created my me. Your poetry narration is very nice too. Black is something that absorbs all and knows how to live with everything in peace! very well thought and written Ankita! Great post. Awesome post, super like it..